Both beginners and avid collectors will appreciate the attention to detail on this piece! From the high carbon steel blade, to the tight cord wrap (Ito) and metal alloy guard (Tsuba), this sword is fully functional in every sense. The full-tang blade extends to the end of the hardwood handle and comes razor-sharp and thick. The wooden scabbard (Saya) includes a high-gloss finish, nylon cloth and metal Kurigata fittings. 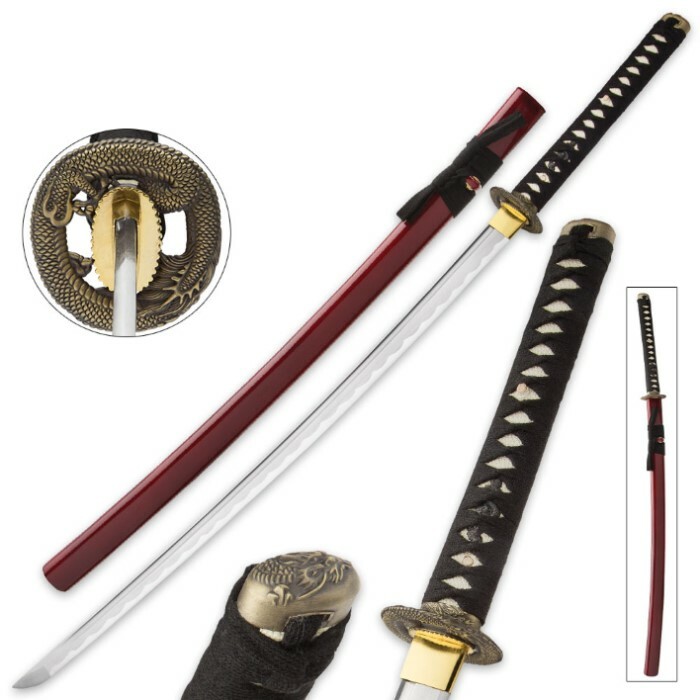 Take hold of your fantasy with this highly sought-after samurai sword! An unparalleled bargain. I can't get over the quality of this item for the price...thank you kennesaw for a great deal. Budk, you are very sneaking offering such a fine sword for such a good price. This was my first sword and If I can get so much sword for so low of a price I am going to have to try some of your higher priced swords to see what they are like. As I said, in the title, Clever Marketing! Had it a few months now. I purchased it mostly for display purposes. I don't do the water bottle cutting routine sorry. I have no doubts however how wickedly effective this sword would be in actual use. The blade seems good quality and reasonably sharp. 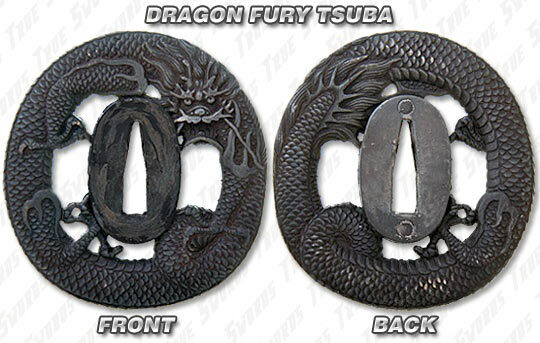 I like the Dragon Motif Tsuba, a real high cool factor there. My wife is from Japan and from a town (Aizu City) which is famed for its Samurai history. Its a wonderful way to show some cross cultural pride with such beautiful swords in the home. (The downside being don't make the lady from said Samurai village too mad). Anyway good sword for the money. 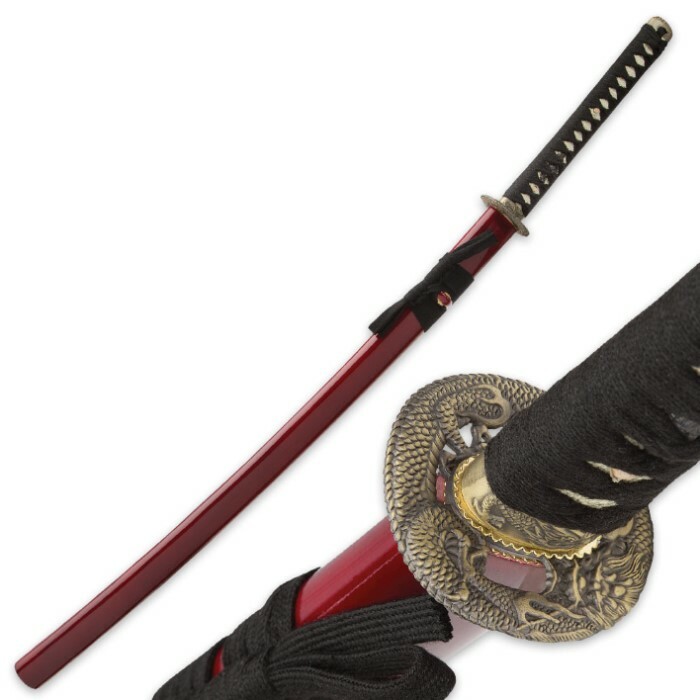 Yea its made in China like everything else is but a real genuine Japanese made sword in the traditional manner would run into the thousands and we prefer to eat good food and not just Ramen every night. Thanks Bud-K for the great selection of Asian type swords and yes I am definitely planning on that Cold Steel Italian Long Sword. Gotta give some love to my European heritage right? The sword over-all is very nice looking to be on display, red sheath, nice engravings. Only issue is the handle wrap coming loose after using it for awhile. Sturdy construction over all, for $60 this is actually amazing. Very nice sword that's comes sharp out of the box and well made. No loose parts and comes exactly as pictured. Defiantly would recommend. This sword is all together amazing, sharp right from the box! hand made and beautiful. this sword is well worth the money ive seen swords that cost twice of this one and are worse the fittings on mine are good and was tightly wrapped came really sharp out the box too, overall a great sword you wont regrett it.